Print Rénergie Multi-Lift Ultra Full Spectrum Anti-Ageing Fluid: a full spectrum of actions to target signs of skin ageing in a new weightless daily firming fluid. After applying this anti-wrinkle fluid, skin feels firmer, wrinkles, hyperpigmentation and dark spots look reduced. With SPF 25 protection, your skin is also protected from daily UV exposure and reveals its uplifted, radiant beauty. Apply this anti-wrinkle firming cream every day on the face, neck and décolleté in circular motions. Use every morning after our Advanced Génifique Serum for smoother and glowing looking skin, follow with our Rénergie Multi-Lift eye cream to complete your morning skincare routine for uplifted, radiant looking skin. Discover your perfect Lancome routine using our skincare finder. Suitable for all skin types, Rénergie Multi-Lift Ultra anti-ageing fluid offers a weightless texture for daily use. Formulated with linseed extract to enhance radiance, reduce the appearance of dark spots and wrinkles and leave skin feeling firmer. The Rénergie Multi-Lift range has been offering the lifting & firming expertise to redefine younger looking skin for 25 years. But did you know that UV exposure is one of the main causes of dark spots & hyperpigmentation, and aging? You can now try our new addition to the Mullti-Lift family: Rénergie Multi-Lift Ultra Fluid, a full spectrum of anti-ageing actions that combines the firming & lifting properties of the franchise with SPF25 and Linseed extracts to help reduce the appearance of dark spots and hyperpigmentation. OUR FIRMING & LIFTING FACE WORKOUT! Help your skin keep in shape by trying this workout with your favourite Rénergie Multi-Lift products. It only takes 2 minutes for our face workout program to help your skin (and spirit) feel more relaxed and trained. Prep your skin with warm ups! Discover our 4 exercises to stretch your face muscles. muscles to help knock out those ageing signs! Discover our 3 exercises to keep your skin in shape. Rénergie massage to get rid of your everyday stress and fatigue. Discover our 4 exercises for a relaxed skin. My skin is Showing wrinkles and dark spots. Lacks firmness and radiance. 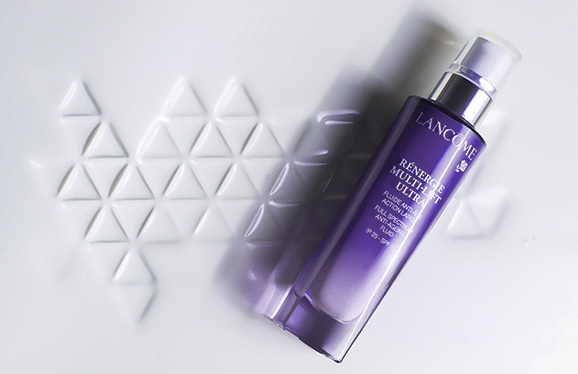 What Lancôme is doing for me Lancôme introduces a fluid that helps target a full spectrum of anti-ageing signs: loss of firmness, wrinkles, dark spots. Rénergie: fulfill your beauty with healthy-looking, radiant skin. And I will feel More confident and fulfilled with healthy-looking, uplifted radiant skin.